The new iPad Wi-Fi models will be available in black or white on Friday, March 16 for a suggested retail price of US$499 for the 16GB model, $599 for the 32GB model and $699 for the 64GB model. iPad Wi-Fi + 4G for either AT&T or Verizon will be available for a suggested retail price of $629 for the 16GB model, $729 for the 32GB model and $829 for the 64GB model. 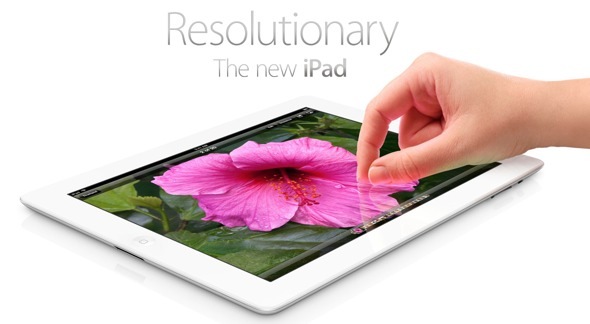 iPad will be sold in the US through the Apple Store, Apple’s retail stores, and select Apple Authorized Resellers. iPad will also be available in Australia, Canada, France, Germany, Hong Kong, Japan, Puerto Rico, Singapore, Switzerland, UK and the US Virgin Islands on Friday, March 16. Customers can begin pre-ordering their new iPad today, and the incredible iPad 2 is now offered at a more affordable price of $399 for the 16GB Wi-Fi model and just $529 for the 16GB Wi-Fi + 3G model. iOS 5.1 and iTunes 10.6 are available today as free software updates. iPhoto, iMovie 1.3 and GarageBand 1.2 are available today for $4.99 each from the App Store. Keynote 1.6, Pages 1.6 and Numbers 1.6 are available today for $9.99 each from the App Store. Updates are available for free to existing customers. By the end of March iPad will be available in Austria, Belgium, Bulgaria, Czech Republic, Denmark, Finland, Greece, Hungary, Iceland, Ireland, Italy, Liechtenstein, Luxembourg, Macau, Mexico, The Netherlands, New Zealand, Norway, Poland, Portugal, Romania, Slovakia, Slovenia, Spain and Sweden. More info about the new iPad here. Yes, but Jobs would call it iPad Retina or, at least, iPad 3. The more so the first exemplars of Retina iPad appeared last winter (4X graphics appeared in iOS at that time), so Jobs certainly already used test devices. Design for such things get finalized like half year before actual release, so Jobs probably used final version of this preproduction iPad in September. It looks to me like it will just be called an iPad. There is no need for anything else with the name. EXACTLY. Apple leads, once again, by DITCHING the idiotic product naming game. Who said that physical objects had to have version numbers like software? If they call this (3rd gen) “iPad”, and then a new one later (4th gen) also simply “iPad”, how do you tell the difference when used models are being sold on eBay or Craigslist? A buyer could be deceived or confused into buying the wrong one, and the seller could not be held for deception – he advertised the product simply as it is called: iPad. Version numbers are more than just marketing gimmicks; they are useful for hard-/software compatibility, differentiation in resale (when several models are no longer the new model), etc. Why is it suddenly “idiotic” when Apple stopped it? Was Apple just as idiotic when they did use it? The model year of the product you do not physically have in your hands? Which (online storefront) photograph may not adequately differentiate which model you are viewing? Remember that even with automobiles, there is a declared “version number” – the model year – used in advertising and sales; and this is besides the fact that there are often obvious differences in the design across model years. While Apple may not stamp the model number on the product, they will have to make the version very explicit at point-of-sale, especially on their Refurbished/Clearance web site (but ne’er-do-well resellers will probably still try to exploit this). I guess you are going to have to, to some degree, trust those sellers. What’s to stop them from using a screen shot of the “About” screen? My 2008 and 2012 Ford F-150 have the same name – just different years …. Right, Ansel, and as evidenced by your own post, you had to differentiate them by citing model year. You wouldn’t just buy an F-150; you’d want to know the model year in question before you even met the reseller. I suppose in the end you have to sacrifice one for the other – a serial name that identifies the model (iPad3), or a fixed name with a “must-mention” extended reference (iPad, 3rd generation). The latter has been the case with iPods and Macs, but without a model reference, non-new models are tricky to identify – even Apple’s refurb site uses indeterminate references like “Originally released September 2010 “. Hard to tell if that supports iOS5, for instance (an issue one never deals with in cars, and part of the reason gadgets need a version in name or by reference). But in neither case is the version reference “idiotic”. And, not to belabor the point, even cars do differentiate not only by model year, but also trims – XL, STX, 325i, 330i, S550, S600, etc. Car names are not entirely short and sweet. You mean to say that Apple had a nomenclature problem with the hard drive iPod for 5 years? I’m with you. HD didn’t make any sense as they will all be (new) HD going forward. So I don’t know why you don’t call it iPad 3? Very Microsoft like. Also, how is it that the store is down again? Can’t be volume as Apple has had so many problems in the past so surely they were prepared this time? I guess not. I only had to click checkout for my new iPad 3 when the store went offline! C’mon Apple ya gotta do better than that. Finally! Order went through. Took 2 hours. 16 GB Black Wi Fi. It’s what I had in my iPad 1 and iPad 2. Nuff for me. Can’t wait to see the new screen. An iMac is still called an iMac. “The new iMac.” The new iPad. How about “The New Mac Pro?”…. Yea but BLN is crying because there was no small one. Its also not quad core so BLN has already written it off as old tech. Surely Samdung will bury it with the next galaxy! Right BLN ? No Siri on iPad3? NO THANKS, I’m so disappointed. I’LL PASS on you iPad 3 whatever they called you. I WAIT FOR SIRI.I’m buying ipad 2 for now. Don’t be so hasty, young hobbit. Siri is only a software update away. C’mon stop being monkey. Don’t jump and tell me that.its not only me expecting for siri to be release with this new ipad. Everyone is upset and I’m sure you do the samething. This is a big mistake for apple. Personally, if the $100 is not an issue, I would advise against doing that. The iPad 2 will never get Siri. The new iPad has the skillz to have Siri be a simple software update. I would future proof as much as possible. Dictate text is very helpful. I agree. This update is great for some but not the universal “WOW” that the iPad 2 was. Ipad 2 is plenty for me. I’ll wait til next year. While watching the video I found myself wishing that it was Steve up their. Anybody able to download 5.1 yet? Got it on my iPad 1. I’ve downloaded it for my iPhone 4 and iPad 2. I’m surprised how quickly it downloaded. The last major iOS update seemed to crash the Apple farm servers…or there were serious wide spread network latency issues. Siri. That’s one piece I was really hoping for as someone who’s got several months left on my iPhone 4 contract and waiting for the successor to the 4s. Still probably jumping in for the resolution alone and graphics alone . . . and glad I’m on here bitching about the lack of a Verizon iPhone like I used to. Still, Siri . . . would have really liked full Siri support. Siri is personal assistant for pocket device which is always with you. So there was never real chances that it would appear on iPad. Not this time at least. Sorry I don’t agree, the iPad is an intimate portable device and would/is perfectly suited to having a personal assistant. When I’m surfing the web say on the sofa or in bed, what better means of finding stuff is there than talking to Siri. It doesn’t need to be a pocket device to make Siri relevant. Siri requires an always on internet connection. I think Apple is trying to avoid people wondering why it doesn’t work when they are out of wifi range. You’re right, where is Siri, I seriously don’t understand Apple’s thinking here, surely Siri should be a major part of Apple’s road map, it’s a killer feature that blows the iPad wannabes away. Siri is a feature that can’t be matched or bested by the iClones, unlike retina and 4g. Retina looks amazing and am looking forward to seeing it for real, but otherwise it’s meh for me today. Love looking at your multi-million dollar properties. I’ll give you a call as soon as I win the lottery. Suspect serious SIRI refinements are being stuck into the code as we speak…so to speak. Retina display, Quad Core A5, 2X the RAM, 1080p iSight, 4GLTE, Same price point. I hear you, Chuck. My iPad 1 got all the new features AND significant slowdown. I think if I could go back to 4.3 I would. On the other hand, the iPad 3 I’m planning to get will seem all the faster!! Don’t have a link, but I watched on Engadget and they showed a slide from the keynote. Small correction – It’s a dual-core A5X chip with quad-core graphics. Which I think is better because graphics reap more benefits from multiple cores. Oh, and one of the game developers at today’s event mentioned that new iPad had double the RAM, which would make it 1GB. iOS can do a hell of a lot more with 1 GB of RAM than Android or Windows 8 can. Good luck trying to order today. Tried to through business sales. I was told they are having problems with their servers and website.This was over the phone and the agent couldn’t do a transaction. Massive response crashed the servers…. Patience… baby steps. $399 makes things plenty tough as it is. Go with a refurbished one from the Apple store. They have the same warranty, a new battery, and cost less. Up in the air about the dropping of the numbering system. I wish they could have waited until the iPad 4. Also, what is up with the dictation feature? Is it Siri or not? Maybe Siri will be enabled later via a software update? Finally, I would love to see Apple offer a 8 GB iPad 2 (wi-fi only) for $299. Kindle Killer Deluxe Edition! No matter what Apple does, it’s never enough for some people, is it? Even the $399 iPad gets multiple comments pulling for $299 instead. Sheesh, folks – have some appreciation for the amazing stuff Apple has actually accomplished. I’m glad you said what I was thinking, so I didn’t have to say it myself. After reading about the top-of-the-line new iPad, I was shocked at how inexpensive it is, relatively speaking! Yeah, a $299 iPad 2 would be a Kindle Killer™. The kindle is a kindle killer. For the largest most successful company ever in the history of the world why can’t they have servers that can handle the expected crush of first day ordering? FRUSTRATING.